In 1940's England a mother, Adeline (Helen Crevel) and her sulky daughter, Chloe (Layla Watts) flee to the countryside to escape the bombs hitting the city. They arrive at a seemingly disheveled manor house and the landlord, Arthur (Philip Ridout) welcomes them and assures the mother that they are quite safe there. Whilst unpacking they discover a rather creepy looking doll that appears to move about on its own and generally terrorizes the pair. 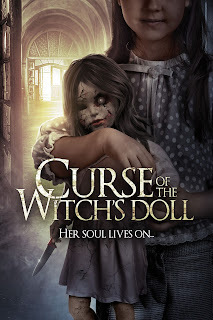 Soon after, Chloe goes missing during a game of hide & seek, causing Adeline to discover that the doll is inhabited by the soul of a witch. To save her daughter Adeline must face the witch and try to decipher truth from delusion. There is an odd mix of stories in this that are all linked by the doll and the manor house which I believe to be a rather confused effort to try and jazz up the usual haunted doll rhetoric. Unfortunately this did not really help and only succeeded in making it more clichéd, with awkward dialogue ("Ready or not, I'm going to get you"), endless whispering and a ton of jump scares. I have to admit that I found the doll really bloody creepy and because of my doll phobia fell for quite a lot of the scares but even I eventually tired of them. It is worth noting that the doll in the poster artwork is nothing like the actual doll in the movie. It is far more grotesque (and butch) with huge bulging eyes and an off putting grimace nothing like the fragile looking cracked porcelain dolly shown in the artwork. It seems misleading and conveys the feeling that they themselves aren't quite convinced by their own creation. There is a lot to be said for character integrity as it tends to draw you in but alas once again the acting from all involved was lack lustre and unconvincing, plus there was some odd casting in there as well (one detective was agonizingly awkward and reminded me of Ross Kemp!). They probably should have cut it down a fair bit as at times I felt that it dragged on a bit but the setting was rather eerie and the soundtrack was atmospheric so I guess that is something positive to say about it.